I am a Research Scientist in the Earth, Atmospheric and Planetary Sciences Department at MIT, with a background in Engineering and Applied Mathematics. 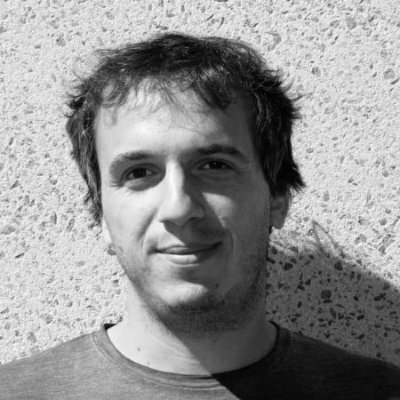 My research focuses on the use of observations and numerical models to improve our understanding of the dynamics of the ocean, and on the development of control algorithms for persistent, autonomous observational platforms. The Beaufort Gyre, a central component of the Arctic circulation, is the result of wind driven Ekman pumping which sets the depth of the pycnocline, and leads to a convergence of cold, fresh water at the center of the gyre. The strength of the gyre has important implications both within and outside the Arctic Ocean: the accumulation of the cold, low salinity water insulates the Arctic ice from the warm deep currents of Atlantic origin, while its release generates salinity anomalies influencing the North Atlantic Ocean circulation on a decadal time scale. I work with observations, simple analytical models, and idealized and realistic numerical models, to understand and characterize the momentum transfer between the atmosphere and the ocean, and the mechanism that governs the accumulation and release of freshwater. In-situ observations of tropical storms (hurricanes, cyclones, and typhoons) are essential for improving both storms forecast and our understanding of their genesis and development. Despite the continuous development of satellite based products, in-situ observations represent the most important contribution to the initialization of forecast models. They are also difficult, costly, and dangerous to obtain: the design of in-situ observational platforms often requires a tradeoff between persistency --- the ability to observe for long period of time --- and controllability --- the ability to direct observations to particularly interesting areas. My research focuses on a novel approach that uses swarms of atmospheric balloons as a persistent, low-energy, buoyancy controllable platform, with the ability to bridge the gap between persistency and controllability. The Beaufort Gyre (BG) is a large anticyclonic circulation in the Arctic Ocean. Its strength is directly related to the halocline depth, and therefore also to the storage of freshwater. It has recently been proposed that the equilibrium state of the BG is set by the Ice-Ocean Governor, a negative feedback between surface currents and ice-ocean stress, rather than a balance between lateral mesoscale eddy fluxes and surface Ekman pumping. However, mesoscale eddies are present in the Arctic Ocean; it is therefore important to extend the Ice-Ocean Governor theory to include lateral fluxes due to mesoscale eddies. Here, a non-linear ordinary differential equation is derived that represents the effects of wind-stress, the Ice-Ocean Governor, and eddy fluxes. Equilibrium and time-varying solutions to this three-way balance equation are obtained and shown to closely match the output from a hierarchy of numerical simulations, indicating that the analytical model represents the processes controlling BG equilibration. 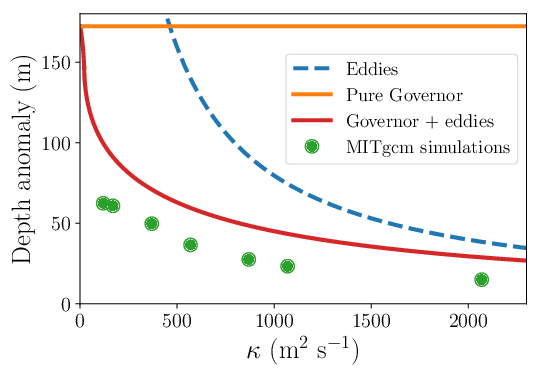 The equilibration timescale derived from this three-way balance is faster than the eddy equilibration timescale and slower than the Ice-Ocean Governor equilibration timescales for most values of eddy diffusivity. The sensitivity of the BG equilibrium depth to changes in eddy diffusivity and the presence of the Ice-Ocean Governor is also explored. 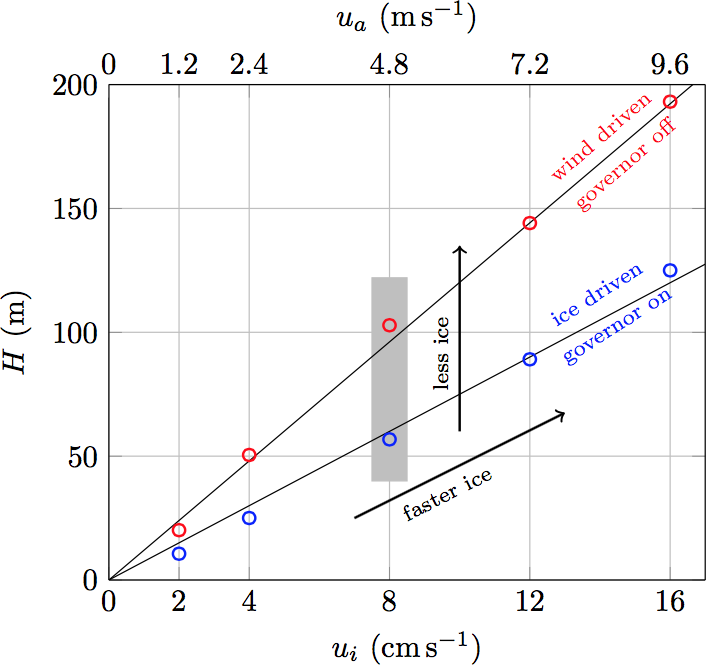 These results show that predicting the response of the BG to changing surface forcing and sea ice conditions requires faithfully capturing the three-way balance between the Ice-Ocean Governor, wind stress, and eddy fluxes. – G. Meneghello, E. W. Doddridge, J. Marshall, J. Scott, J-M Campin. Exploring the role of the “Ice-Ocean governor” and mesoscale eddies in the equilibration of the Beaufort Gyre: lessons from observations. Under review in J. Phys. Oceanogr. Observations of Ekman pumping, sea surface height anomaly, and isohaline depth anomaly over the Beaufort Gyre are used to explore the relative importance and role of (i) feedbacks between ice and ocean currents, dubbed the “Ice-Ocean governor” and (ii) mesoscale eddy processes in the equilibration of the Beaufort Gyre. A two-layer model of the gyre is fit to observations and used to explore the mechanisms governing the gyre evolution from the monthly to the decennial time scale. The Ice-Ocean governor dominates the response on inter-annual timescales, with eddy processes becoming evident on the longest, decadal timescales. Based on analysis of observational data it has been suggested that a negative feedback of ice-ocean stress coupling may limit freshwater accumulation in the Beaufort Gyre (BG). In this paper we explore how this feedback can significantly contribute to BG stabilization in an anticyclonic wind regime. We use an ice-ocean model and turn on and off the feedback in simulations to elucidate the role of the feedback. When a persistent anticyclonic wind anomaly is applied over the BG, liquid freshwater content (FWC) increases due to enhanced Ekman downwelling. As a consequence, ocean surface geostrophic currents speed up. However, the spin-up of sea ice is weaker than the acceleration of surface geostrophic currents during wintertime, due to strong sea ice internal stress when ice concentration is high and ice is thick. 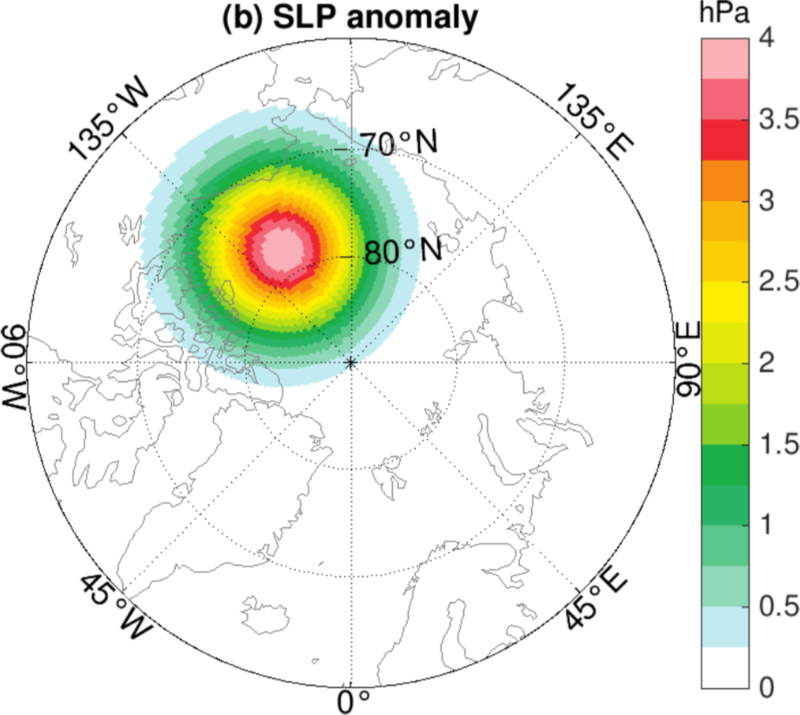 This leads to cyclonic anomalies in the ice-ocean relative velocity and stress over the BG. The resultant seasonal Ekman upwelling anomaly reduces freshwater accumulation by about 1/4 as compared to a simulation with the negative feedback turned off in a control experiment, with a reduction range of 1/10 to 1/3 in all experiments conducted. 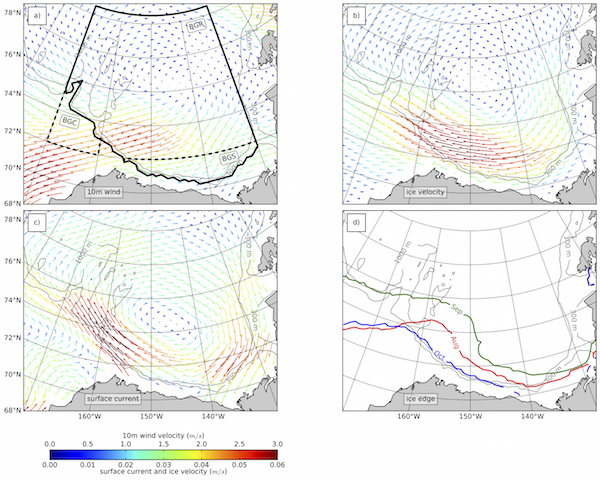 We show that the feedback is more effective when the model’s mesoscale eddy diffusivity is smaller or when sea ice internal stress is stronger. Finally, we argue that the ice-ocean stress feedback may become less significant as the Arctic warms and sea ice declines. The Beaufort Gyre is a key circulation system of the Arctic Ocean and its main reservoir of freshwater. Freshwater storage and release affects Arctic sea-ice cover, as well as North Atlantic and global climate. We describe a mechanism that is fundamental to the dynamics of the Gyre, namely the "ice-ocean stress governor". Wind blows over the ice and the ice drags the ocean. But as the gyre spins up, currents catch the ice up and turn off the surface stress. 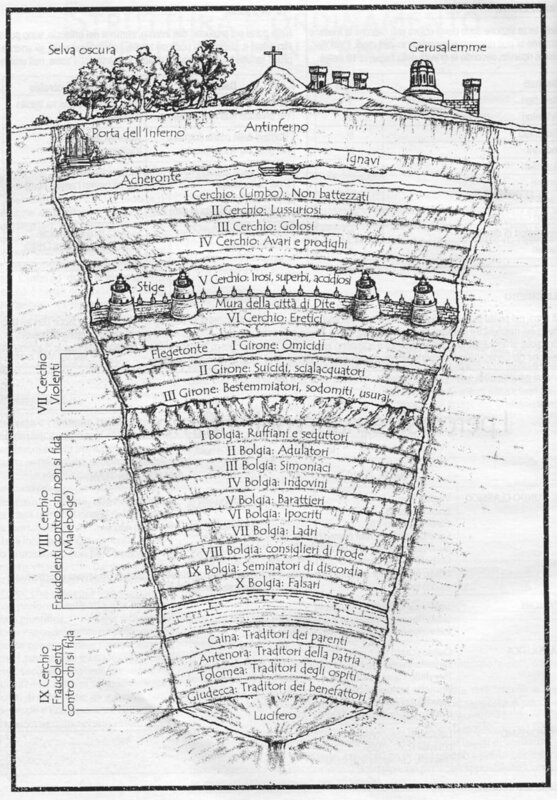 This governor sets the basic properties of the gyre, such as its depth, freshwater content, and strength. Analytical and numerical modeling is employed to contrast the equilibration processes in an ice-covered versus ice-free gyre. We argue that as the Arctic warms, reduced sea-ice extent and more mobile ice will result in a deeper and faster Beaufort Gyre, accumulating more freshwater that will be released by Ekman upwelling or baroclinic instability. We present observational estimates of Ekman pumping in the Beaufort Gyre region. Averaged over the Canada Basin, our results show a 2003-2012 average of 2.5m/y downward with strong seasonal and interannual variability superimposed: monthly and yearly means range from 30m/y downward to 10m/y upward. A clear seasonal cycle is evident with intense downwelling in autumn and upwelling during the winter months. Wintertime upwelling is associated with friction between the large scale Beaufort Gyre ocean circulation and the surface ice pack, and contrasts with previous estimates of year-long downwelling; as a consequence, the yearly cumulative Ekman pumping over the gyre is significantly reduced. The spatial distribution of Ekman pumping is modified as well, with the Beaufort Gyre region showing alternating, moderate upwelling and downwelling, while a more intense, year-long downwelling averaging 17.5m/y is identified in the northern Chukchi Sea region. Implications of our results for understanding Arctic Ocean dynamics and change are discussed. 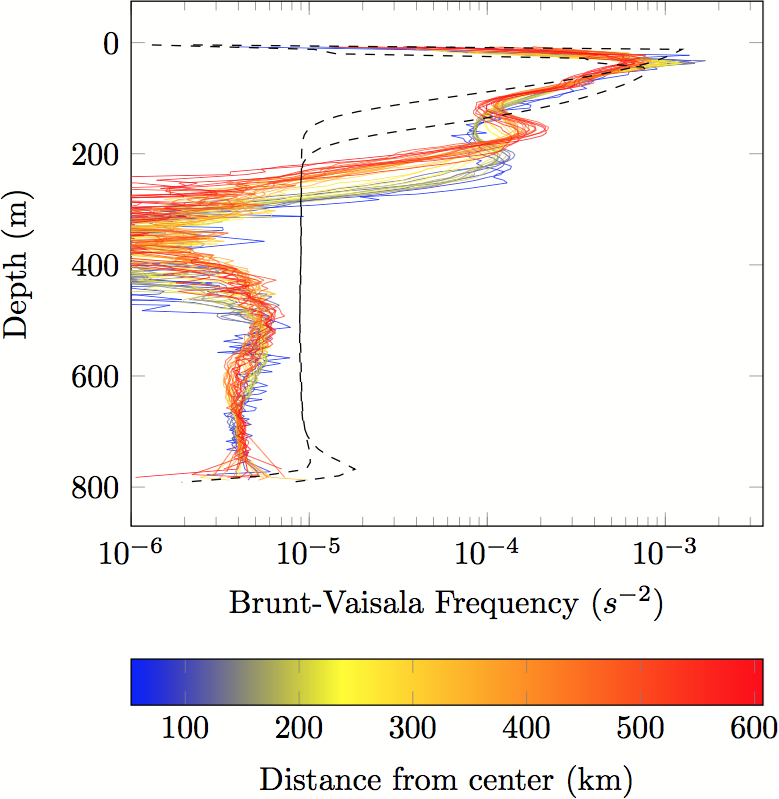 Using Ekman pumping rates mediated by sea-ice in the Arctic Ocean's Beaufort Gyre (BG), the magnitude of lateral eddy diffusivities required to balance downward pumping is inferred. In this limit --- that of vanishing residual-mean circulation --- eddy-induced upwelling exactly balances downward pumping. 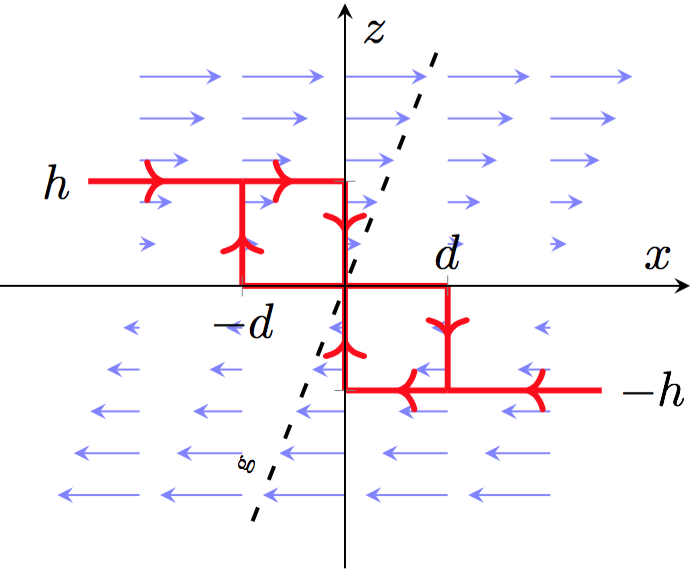 The implied eddy diffusivity varies spatially with values of 50-400 m2/s, and decays with depth. Eddy diffusivity estimated using mixing length theory applied to BG mooring data exhibits a similar range of values from 100 m2/s to more than 600 m2/s, and also decays with depth. We conclude that eddy diffusivities in the BG are likely large enough to balance downward Ekman pumping, arresting the deepening of the gyre and suggesting that eddies play a zero-order role in buoyancy and freshwater budgets of the BG. 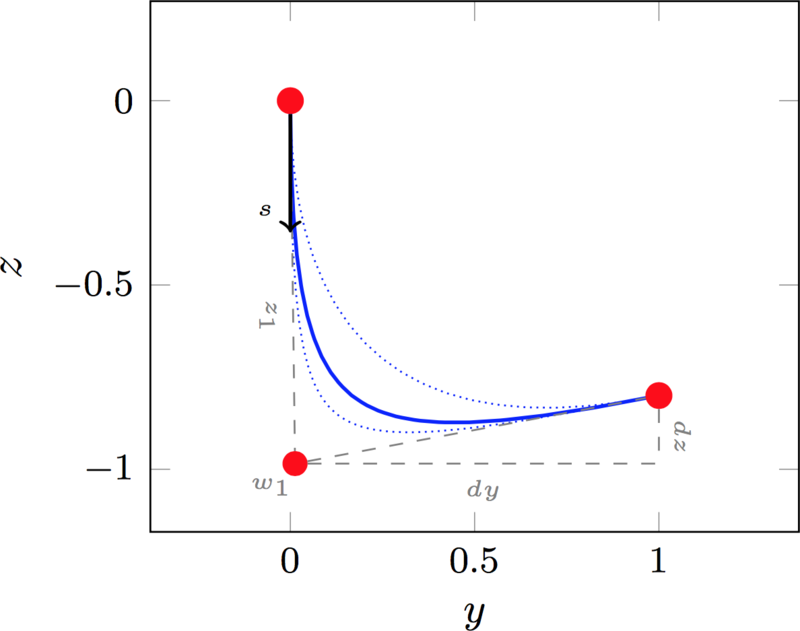 A probabilistic framework is proposed for the optimization of efficient switched control strategies for physical systems dominated by stochastic excitation. In this framework, the equation for the state trajectory is replaced with an equivalent equation for its probability distribution function in the constrained optimization setting. This allows for a large class of control rules to be considered, including hysteresis and a mix of continuous and discrete random variables. The problem of steering atmospheric balloons within a stratified flowfield is a motivating application; the same approach can be extended to a variety of mixed-variable stochastic systems and to new classes of control rules. Accurate long-term forecasts of the path and intensity of severe hurricanes are imperative to protect property and save lives. Extensive real-time measurements within hurricanes, especially near their core, are essential for supplementing the limited relevant information accessible by satellites in order to improve such forecasts. Current operational methods for obtaining in situ information, such as dropsondes and repeated manned and unmanned aircraft flights over and within hurricanes, are both expensive and limited in duration. In the present work it is demonstrated by numerical experiments how a swarm of robust, inexpensive, buoyancy-controlled, sensor-laden balloons might be deployed and controlled in an energetically efficient, coordinated fashion, for days at a time, to continuously monitor relevant properties (pressure, humidity, temperature, and wind speed) of a hurricane as it develops. Rather than fighting its gale-force winds, the strong and predictable stratification of these winds is leveraged to efficiently disperse the balloons into a favorable time- evolving distribution. An iterative bootstrap approach is envisioned in which (a) sensor balloons are used to help improve the available computational estimate of the uncertain and underresolved flow field of the hurricane and (b) this (imprecise) estimate of the hurricane flow field is leveraged to improve the distribution of the sensor balloons, which then better facilitates (a), etc. The control approach envisioned in this ambitious effort is a combination of (centrally computed) model predictive control for coordination at the largest scales, which is the focus of the present paper, coupled with a feedback control strategy (decentrally computed, on the balloons themselves), for smaller-scale corrections. Our work indicates that, following such an approach, certain target orbits of interest within the hurricane can be continuously sampled by some balloons, while others make repeated sweeps between the eye and the spiral rain bands. A global stability analysis of the boundary layer in the leading edge of a swept wing is performed in the incompressible flow regime. It is demonstrated that the global eigenfunctions display the features characterizing the local instability of the attachment line, as in swept Hiemenz flow, and those of local cross-flow instabilities further downstream along the wing. A continuous connection along the chordwise direction is established between the two local eigenfunctions. An adjoint-based receptivity analysis reveals that the global eigenfunction is most responsive to forcing applied in the immediate vicinity of the attachment line. Furthermore, a sensitivity analysis identifies the wavemaker at a location that is also very close to the attachment line where the corresponding local instability analysis holds: the local cross-flow instability further along the wing is merely fed by its attachment-line counterpart. As a consequence, global mode calculations for the entire leading-edge region only need to include attachment-line structures. The result additionally implies that effective open-loop control strategies should focus on base-flow modifications in the region where the local attachment-line instability prevails. A global optimization algorithm recently developed by our group, dubbed ∆- DOGS, is applied to optimize the design of a racing catamaran’s hydrofoil. A computationally inexpensive vortex-lattice based model of the hydrofoil, implemented in AVL (the Athena Vortex Lattice code), is used to compute the flow around the hydrofoil; the suitability of this inexpensive model for such a design optimization is considered carefully in light of available experimental data. While keeping the lift and side force of the hydrofoil constant, the optimization algorithm reduces the drag of the hydrofoil by over a factor of two. In this paper, a low-cost balloon observation system is proposed for sustained (week-long), broadly distributed, in-situ measurements of hurricane development. The high-quality, high-density (in both space and time) measurements to be made available by such a system should be instrumental in significantly improving our ability to forecast such extreme and dangerous atmospheric events. The present paper focuses specifically on developing the overall requirements and specifications of the balloons making up such a system, including a rough budget of the mass, energy, and cost of the key components of each balloon. A brief review of the specific balloon technology and control strategies to be used in the system is also included; both of these topics are discussed much further in our companion publications included in the references. Delaunay-based derivative-free optimization leveraging global surrogates (Δ-DOGS) is a recently-developed optimization algorithm designed for nonsmooth functions in a handful of adjustable parameters. The first implementation of the original Δ-DOGS algorithm used polyharmonic splines to develop an inexpensive interpolating "surrogate" of the (expensive) function of interest. The behavior of this surrogate was found to be irregular in cases for which the function of interest turned out to be much more strongly dependent on some of the adjustable parameters than others. This irregularity of the surrogate led to the optimization algorithm requiring many more function evaluations than might have otherwise been necessary. In the present work, a modified interpolation strategy, dubbed multivariate adaptive polyharmonic splines (MAPS), is proposed to mitigate this irregular behavior, thereby accelerating the convergence of Δ-DOGS. The MAPS approach modifies the natural polyharmonic spline (NPS) approach by rescaling the parameters according to their significance in the optimization problem based on the data available at each iteration. This regularization of the NPS approach ultimately reduces the number of function evaluations required by Δ-DOGS to achieve a specified level of convergence in optimization problems characterized by parameters of varying degrees of significance. The importance of this rescaling of the parameters during the interpolation step is problem specific. To quantify its beneficial impact on a practical problem, we compare Δ-DOGS with MAPS to Δ-DOGS with NPS on an application related to hydrofoil shape optimization in seven parameters; results indicate a notable acceleration of convergence leveraging the MAPS approach. The feasibility of a buoyancy-based control approach for regulating the horizontal position of atmospheric balloons in stratified and turbulent environmental flows is investigated. Two different control rules are considered, and numerical investigations are performed for a challenging case related to tropical cyclones. 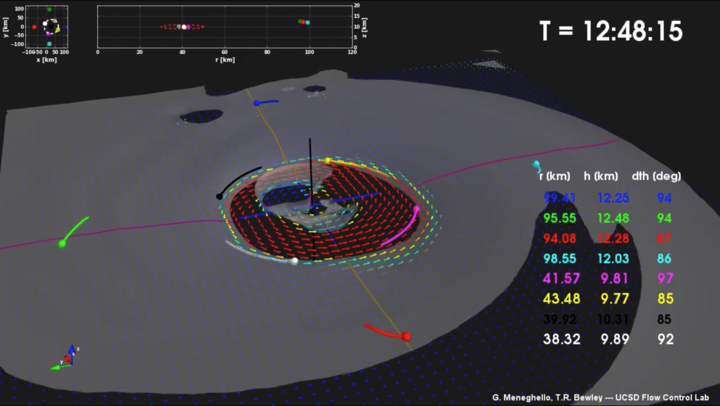 The low energy requirement of the buoyancy-based control approach allows continuous, in-situ observations that extend over much longer periods, and at a significantly reduced cost, than what is achievable with current observation platforms, while maintaining a high degree of maneuverability. 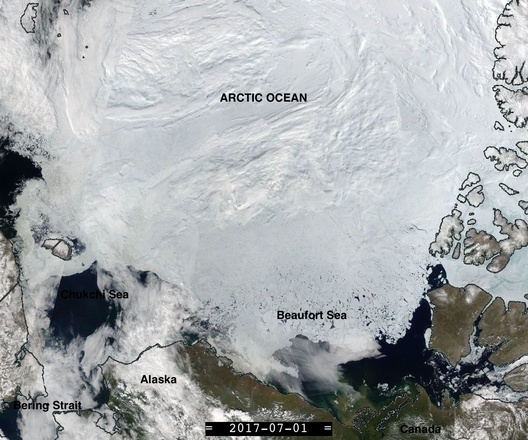 The Arctic's fresh water increase of the past thirty years is in large part concentrated in the Beaufort Gyre (see, e.g. Haine 2015). In order to better understand the main mechanisms behind this change, we build on previous theoretical models by Marshall, Karsten (2002) and Manucharyan (2015) in which the effect of the wind pumping down freshwater in to the gyre is equilibrated by lateral 'bolus fluxes' by eddies. We identify key non-dimensionless parameters and review scaling laws governing the fresh water content of the gyre. Using data from previous idealized rotating fluid experiments and new numerical experiments, we show that a single dimensionless parameter is sufficient to characterize the buoyancy anomaly over a wide range of values. Additionally, comparison with results for the Antarctic Circumpolar Current suggests that the same scaling holds in both cases. Finally, theoretical and numerical predictions are compared with observations. Real-time measurements within hurricanes are essential to improve forecasts, protect property and save lives. Current methods for obtaining in-situ data, including radar and satellite imagery as well as drop-sondes deployed from repeated aircraft flights above or even within the hurricane itself, are costly, dangerous and limited in duration or resolution. We demonstrate how a swarm of inexpensive, buoyancy-controlled, sensor-laden balloons can be deployed from altitude or from sea-level within a hurricane flow field, and coordinated autonomously in an energetically-efficient fashion to persistently and continuously monitor relevant properties (pressure, humidity, temperature, windspeed) of a hurricane for days at a time. Rather than fighting the gale-force winds in the storm, the strong, predictable stratification of these winds is leveraged to disperse the balloons into a favorable, time-evolving distribution and to follow the hurricane track as it moves. 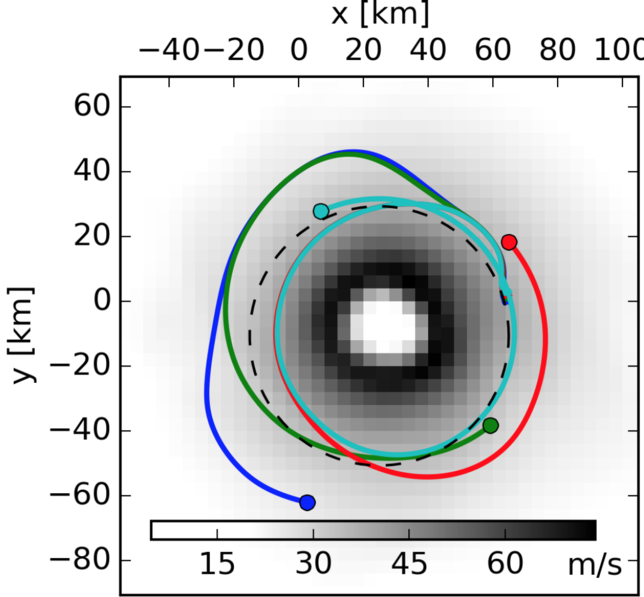 Certain target orbits of interest in the hurricane can be continuously sampled by some balloons, while other balloons make continuous sweeps between the eye and the spiral rain bands. We expect the acquired data to complement current measurement methods and to be instrumental in improving the numerical models' forecast skills. We perform a global receptivity and sensitivity analysis of a swept-wing, incompressible boundary layer in a domain covering the attachment line as well as an extended region downstream of it. Despite performing our analysis in a stable flow regime — all our eigenvectors are decaying — we provide qualitative connections with previous local and global results in unstable regimes: the identification of the most receptive and sensitive regions within our domain provides an explanation for the validity of the local analysis results. The tools used are the one of modal analysis — eigenvectors and eigenvalues decomposition — and optimization theory. Receptivity and sensitivity form the foundation for the passive and active manipulation of the flow by applying control-theoretic means. 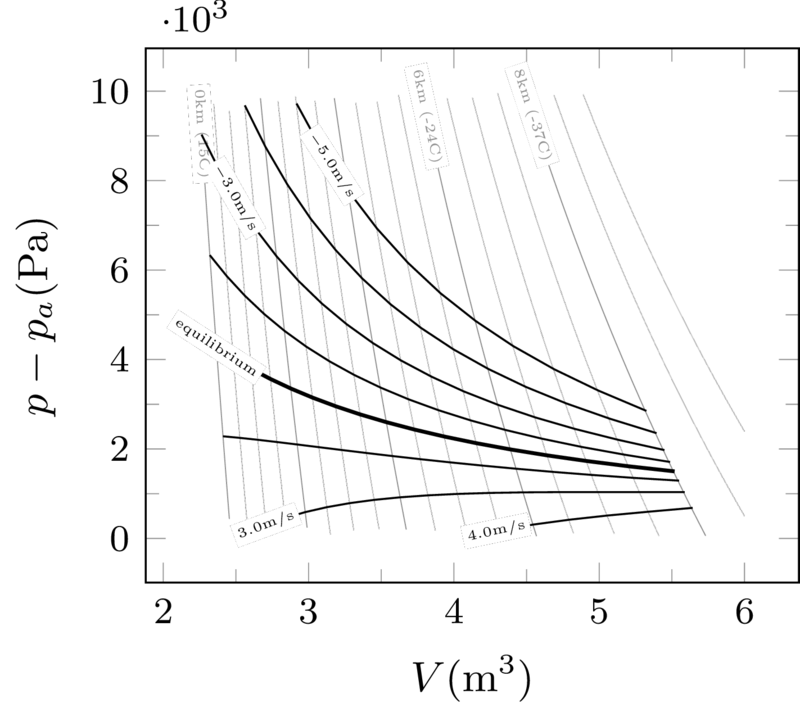 Trajectories of eight buoyancy controlled atmospheric balloons in a CM1 simulation of a hurricane. Four balloons are deployed from an altitude of 20km, while the other four are deployed from sea level. The simulation shows manouvering of the balloons and the targeting of different regions of the storm. 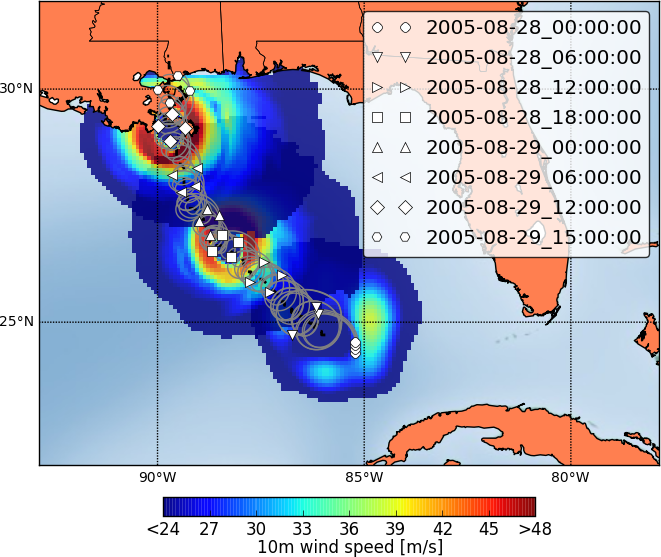 Trajectories of four, buoyancy-controlled atmospheric balloons in a WRF forecast of hurricane Katrina, from August, 28th 00:00GMT to August, 29th 15:00GMT. The balloons are initially clustered together, reach an optimized formation after approximately 10 hours and maintain it to the end of the simulation. 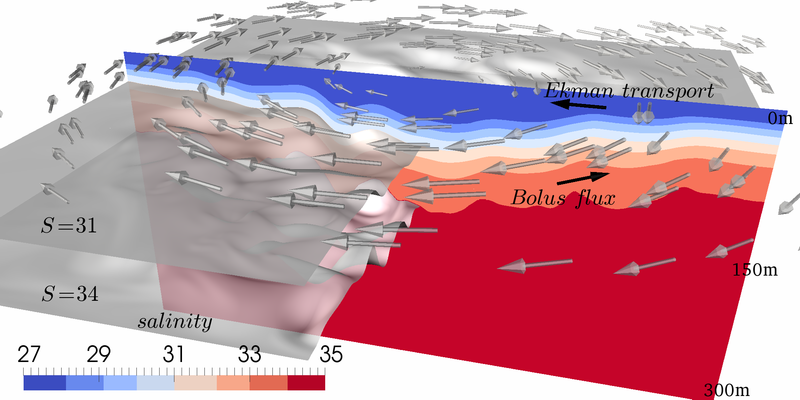 Idealized model of the Beaufort Gyre: the wind driven Ekman pumping deepens the haloclyne at the center of the gyre, to the point when baroclinic instability develops and the accumulated freshwater is transported out of the gyre by baroclinic eddies. NB: it takes a while to see the instability develop, be patient! Satellite images of the Beaufort Gyre ice cover. During winter, the ice cover is almost immobile. Starting from mid April, the ice melts and fractures, and is driven anticyclonically by wind and currents. The ice cover, and its interaction with the currents, are a foundamental mechanism in regulating the Beaufort Gyre freshwater content and current intensity. Animation adapted from an original by Georgy Manucharyian. 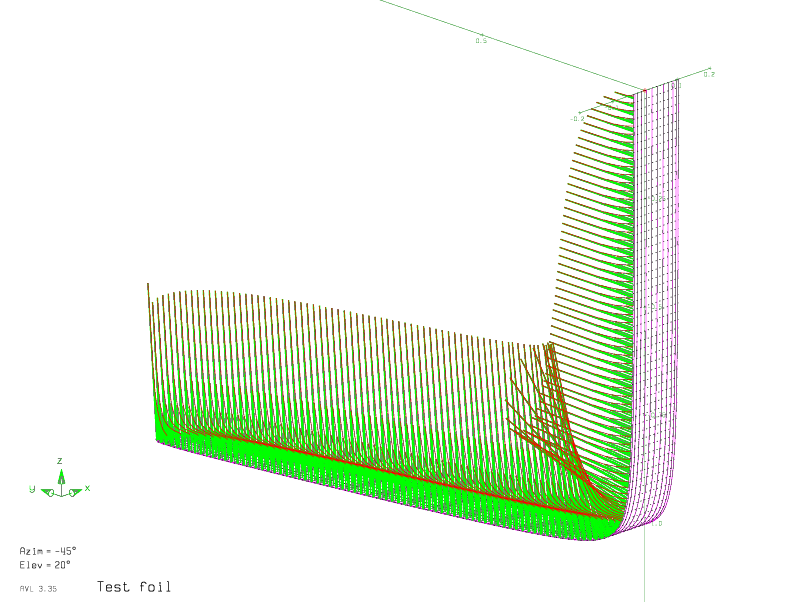 The goal of this study is the analysis of the stability and receptivity properties of the three-dimensional flow past the leading edge of a swept wing. The project is divided into two parts: (i) the computation of the steady base flow as a solution of the steady-state Navier-Stokes equations and (ii) the study of the direct and adjoint eigenvalue problems obtained by linearizing the time-dependent Navier-Stokes equation around the base flow. In order to address the first part, a DNS code has been developed based on a multigrid framework. The solution of the non-linear steady-state Navier-Stokes equation at various Reynolds numbers is obtained by continuation at a computational cost of nearly O(n), where n is the number of degrees of freedom (dof) of the problem. The study of the stability and receptivity properties is performed by numerically solving the eigenvalue/eigenvector problem. 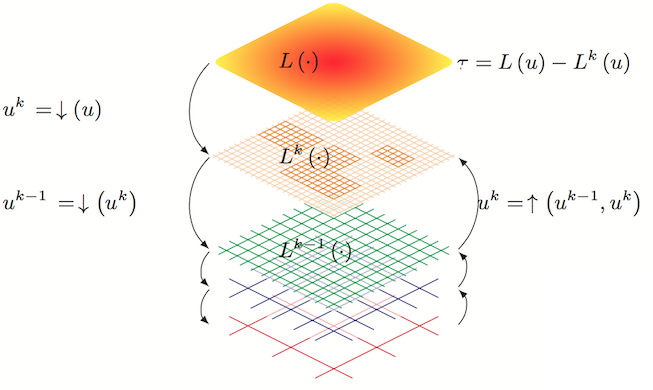 A Krylov-Schur algorithm, coupled with a shift-invert spectral transformation, is used to extract part of the spectrum. Two branches may be identified and one of these is associated with eigenvectors displaying a connection between attachment line and cross-flow modes. The wave-maker region for these eigenvectors is shown to be located close to the attachment line by computing the corresponding solution to the adjoint eigenvalue problem. The numerical global results are compared qualitatively with existing experimental observations and local stability analysis.